Champion & Co was the fourth largest vinegar brewer in Britain and Ireland. Champion & Co, vinegar brewers of London, was established in 1705. In an age before refrigeration, vinegar was a much more important commodity than it is today, due to its preservative effect on foodstuffs. William Champion (died 1799) had acquired a brewery on City Road by 1794. He died suddenly whilst serving as Sheriff of London in 1799, and the business was taken over by his son, Thomas Champion (1774 – 1846). The firm was to owe its subsequent growth, both at home and overseas, to the business acumen of Thomas Champion. From 1813 to 1818 the business was known as Champion & Moore, when a Francis Moore joined in partnership. The premises were burgled in 1814, with £1,000 of valuables stolen. Moore left the partnership in 1818 to establish himself independently. The business was owned by Thomas Champion and Thomas Green from 1821, and traded as Champion & Green. The firm was manufacturing mustard as well as vinegar by 1830. That year the two men were joined by Guy Champion (1786 – 1846), brother to Thomas, who had previously worked as a merchant in Spain. Champion & Green was the fourth largest vinegar brewer in Britain and Ireland by 1832, with 13 percent market share. A fire at the works destroyed the building and stock in 1833. Fortunately the business was insured. According to Charles James Feret (1854 – 1921), writing in 1900, Guy Champion chanced upon a slave auction whilst in Albania. There he bought a girl, who he brought back to England and married. Thomas Green had left the business by 1839. In 1840 the partnership between Guy and Percival Champion, Arthur Mann and William Henry Wright was dissolved. They had been trading under the name Champions, Mann & Wright. The business was transferred to Thomas Champion. Guy Champion died in 1846. His brother Thomas died suddenly whilst organising the funeral arrangements. George Willis and William Henry Wright took over the company in the 1840s, but the Champion family continued to hold a stake, and it continued to trade as Champion & Co.
James Bigwood (1839 – 1919) was the head of the firm by 1871. He was a strong advocate of product purity, and was vehemently opposed to food adulteration. Champion & Co produced well over 1.5 million gallons of vinegar every year by 1872. The firm also produced two tons of mustard per day. The firm employed 170 workers, almost all skilled. The brewery was extended in 1873. A new 53,000 gallon vinegar vat was installed in 1883. It took three months to construct from English oak. It joined 46 other similarly-sized vats at the brewery. There were nearly 200 workmen employed at the brewery by 1883. Many had followed their fathers and grandfathers into the business. Champion & Co had been registered as a limited liability company by 1887. The City Road premises was described as “imposing” in 1890. The brewery was capable of producing up to 10,000 bottles of vinegar every day by 1894. James Bigwood had been joined in the business by his son, James Edward Cecil Bigwood (1863 – 1947) by 1901. The firm was the oldest established vinegar brewery in London by 1907. The brewery site, close to the City of London, became highly valuable, and keen to realise its value, James Bigwood and James Edward Cecil Bigwood sold the business to Slee, Slee & Co, a rival vinegar brewer, to form Champion & Slee Ltd in 1907. The company had a share capital of £140,000. Champion production was relocated to the Slee premises at Church Street, Tower Bridge Road, London, where there was ample room for expansion. 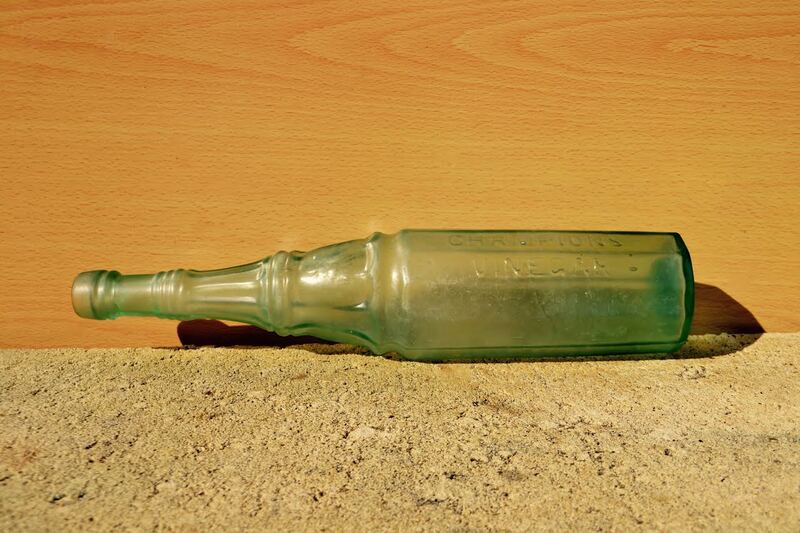 After the First World War, the British vinegar market was suffering from overcapacity. Champion & Slee was acquired, along with rival Sarson’s, by Crosse & Blackwell in 1929. 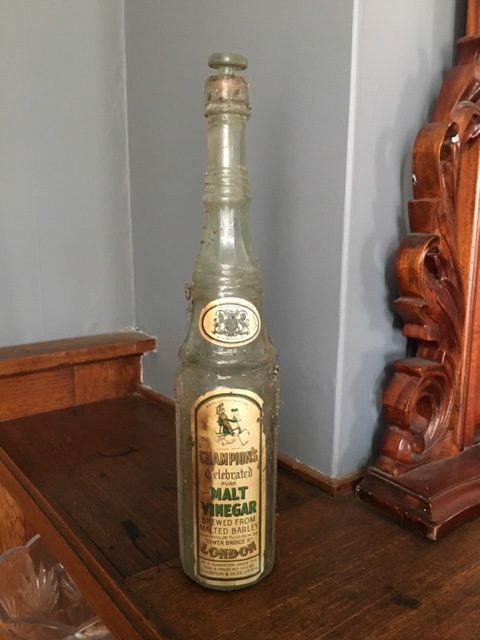 The Champion vinegar brand continued to be advertised until 1955, after which it appears to have been phased out in favour of the Sarson’s brand. Hi,i have a mustard tin by champion of London ,which states it was established in the reign of Queen Anne and as yet having no luck in finding information.Can you help? Champion & Co was established in 1705, during the reign of Queen Anne. If you send me a photo of the tin I’d be happy to upload it to this article. Hi Thomas these are the images i have for this tin…….sorry i do not seem to beable to upload them,especially not being computer illiterate……….I can upload them to a email address,i do not see anything on here to uload….Any help…?????? 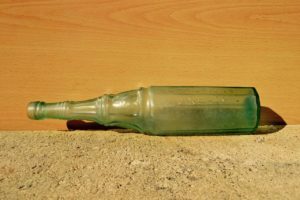 At a small rural museum we have been given a Champion’s Vinegar bottle and on the base is what appears to be the date/year – 1698. From all we have been able to find it seems that Champion’s vinegar was not in existence until some years later. Can you help? Did this company also make barrels? I have a small barrel planter with the name Champion & Co on the base. . . .